The blueberry is sacred to the Native Americans in part because the blossom-end of the berry. This blend can also be made into a flavorful tea and enjoyed. 100% natural. 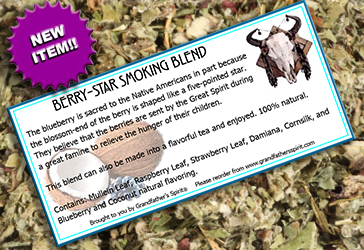 Contains: Mullien leaf, damiana, red raspberry leaf, cornsilk, and blueberry and coconut natural flavors. Available in 1 ounce packages or by the pound. MUST BE 18 OR OLDER TO PURCHASE SMOKING BLENDS! These herbs are a gift from Spirit. May they bless you with their gentle healing powers, now and always. As with any form of sacrament, please use responsibly and with common sense.